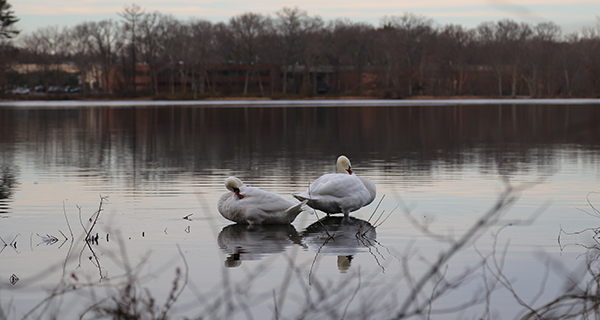 Hidden along the walls of I-95 north and behind a bland park of Needham offices, a far more remarkable park is waiting to be explored. 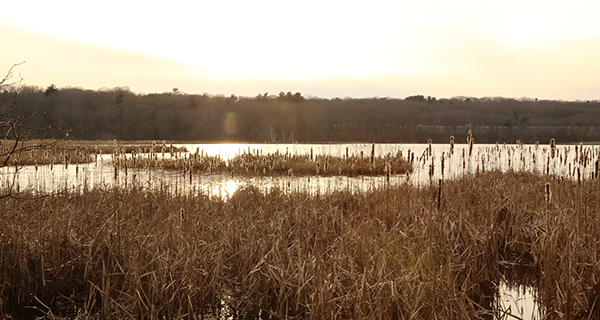 Cutler Park, roughly 600 acres of state preserved trails, trees, ponds, paths, wetlands and boardwalks, is an unexpected piece of nature hiding behind a concrete corner of Needham. Driving down Kendrick Street in Needham, you could find yourself above the rush of 95; to your right there may be a Panera Bread, and to the left you might see the majesty of TransValue Merger and Acquisition Advisors’ black and brick façade. If behind all this you glimpse a flash of water through the trees, turn into the first parking lot you see, because you’ve arrived at Cutler Park. Stepping off the sidewalk and onto Cutler’s dirt path immediately reveals a swath of wilderness with a round, reaching pond. This is Kendrick Pond, and if you take the path east while dogs yip and pant about, the banks of Kendrick become ragged with cattails, while a thin line of trees to the left drop off into a vast expanse of wetlands. Sliced through by the Charles River, the wetlands that Cutler Park comprises and protects are the largest freshwater marshlands in the middle section of the Charles. If this means nothing to you, spend an afternoon following the Blue Heron Trail and you’ll both see the significance and have your breath taken away (then wholly and refreshingly returned). Past the pond the dirt path grows flat and wide, and the trees narrow and tall. Above you, the reaching trunks squeal in the breeze. No matter how deep into the woods you go though, the expanse and the reeds of the wetlands follow diligently at your side, growing larger and larger until quite suddenly, there’s nowhere left to go but straight into them. The trees drop away into a sea of reeds flicking in the wind. Parting down the middle, like Moses before a yellow sea, a long wooden boardwalk parts the reeds and stretches into the marsh. Your shoes clunk on the wood, the breeze shushes through the marsh, and the yipping dogs, the highway commute, and the dead whir of the office park fade into the white noise of cunk, cunk, cunk, shhhhhhhh.